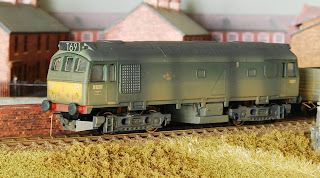 At last Saturday's meeting there were a couple of us with airbrushes and compressors and following Edward's excellent demonstration of weathering there were a few people who gave it a try. Thanks Edward for bringing all the kit and letting us see how you do this particular job. Prior to the meeting I tried out my new airbrush and following Edwards previous guidance I sprayed my class 25 with an all over coat of grime. Humbrol Matt 29 acrylic which is about this shade. Although I did not do any more work on the diesel at the meeting, during the course of this week I have embellished the overall spray using a technique Pete McParlin, of Backwoods Miniatures, showed me once of spraying through a sheet of plasticard with a slit cut in it to limit any over spray. The effect of oil and grime that has run down the body side is quite pleasing, I think but needs to be practised. This was also done with acrylic, Railmatch weathered black. 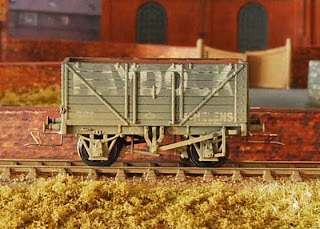 I also have done a little more work on the Mathieson Models wagon that I converted recently. The pictures tell the story.